(lĭng`kən), 1809–65, 16th President of the United States (1861–65). Born on Feb. 12, 1809, in a log cabin in backwoods Hardin co., Ky. (now Larue co.), he grew up on newly broken pioneer farms of the frontier. His father, Thomas Lincoln, was a migratory carpenter and farmer, nearly always poverty-stricken. Little is known of his mother, Nancy Hanks, who died in 1818, not long after the family had settled in the wilds of what is now Spencer co., Ind. Thomas Lincoln soon afterward married Sarah Bush Johnston, a widow; she was a kind and affectionate stepmother to the boy. Abraham had almost no formal schooling—the scattered weeks of school attendance in Kentucky and Indiana amounted to less than a year; but he taught himself, reading and rereading a small stock of books. His first glimpse of the wider world came in a voyage downriver to New Orleans on a flatboat in 1828, but little is known of that journey. In 1830 the Lincolns moved once more, this time to Macon co., Ill.
After another visit to New Orleans, the young Lincoln settled in 1831 in the village of New Salem, Ill., not far from Springfield. There he began by working in a store and managing a mill. By this time a tall (6 ft 4 in./190 cm), rawboned young man, he won much popularity among the inhabitants of the frontier town by his great strength and his flair for storytelling, but most of all by his strength of character. His sincerity and capability won respect that was strengthened by his ability to hold his own in the roughest society. He was chosen captain of a volunteer company gathered for the Black Hawk War (1832), but the company did not see battle. ..... Click the link for more information. , which supposedly occurred at this time, is now discredited. 1818–91, friend, law partner, and biographer of Abraham Lincoln, b. Greensburg, Ky. In 1844 he became the junior member of the Springfield, Ill., law firm of Lincoln and Herndon, a partnership that was never dissolved. ..... Click the link for more information. , who was later to be Lincoln's biographer. Lincoln displayed great ability in law, a ready grasp of argument, and sincerity, color, and lucidity of speech. 1818–82, wife of Abraham Lincoln, b. Lexington, Ky. Of a good Kentucky family, she was living with her sister, daughter-in-law of Gov. Ninian Edwards of Illinois, in Springfield, Ill., when she met and married (1842) Lincoln. ..... Click the link for more information. ) after a troubled courtship. He continued his interest in politics and entered on the national scene by serving one term in Congress (1847–49). He remained obscure, however, and his attacks as a Whig on the motives behind the Mexican War (though he voted for war supplies) seemed unpatriotic to his constituents, so he lost popularity at home. Lincoln worked hard for the election of the Whig candidate, Zachary Taylor, in 1848, but when he was not rewarded with the office he desired—Commissioner of the General Land Office—he decided to retire from politics and return to the practice of law. ..... Click the link for more information. , and succeeded in describing the abhorrent moral nature of slavery that Douglas failed to comprehend. In a speech at Springfield, repeated at Peoria, he attacked the compromises concerning the question of slavery in the territories and invoked the democratic ideals contained in the Declaration of Independence. In 1855 he sought to become a Senator but failed. He had already realized that his sentiments were leading him away from the Whigs and toward the new Republican party, and in 1856 he became a Republican. He quickly came to the fore in the party as a moderate opponent of slavery who could win both the abolitionists and the conservative free-staters, and at the Republican national convention of 1856 he was prominent as a possible vice presidential candidate. Two years later he was nominated by the Republican party to oppose Douglas in the Illinois senatorial race. Accepting the nomination (in a speech delivered at Springfield on June 16), Lincoln gave a ringing declaration in support of the Union: "A house divided against itself cannot stand." The campaign that followed was impressive. Lincoln challenged Douglas to a series of debates (seven were held), in which he delivered masterful addresses for the Union and for the democratic idea. He was not an abolitionist, but he regarded slavery as an injustice and an evil, and uncompromisingly opposed its extension. 1760–1806, American statesman, b. Augusta co., Va; grandfather of John Cabell Breckinridge. After he was admitted (1785) to the bar, he practiced law in Charlottesville, Va. Elected (1792) to the U.S.
..... Click the link for more information. (Constitutional Unionist). Lincoln was elected with a minority of the popular vote. 1787–1863, U.S. public official, b. Woodford co., Ky. A Kentucky legislator (1811–17), Crittenden entered the U.S. Senate (1817–19) but resigned to resume state offices. He served as Attorney General under Presidents William H.
..... Click the link for more information. began. case decided in 1861 by Chief Justice Roger B. Taney sitting as a federal circuit judge in Baltimore. John Merryman, a citizen of Maryland, was imprisoned by the U.S. army on suspicion of favoring the Confederacy. He obtained a writ of habeas corpus. ..... Click the link for more information. ). 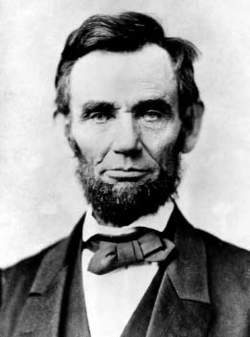 In the course of the war, Lincoln further extended his executive powers, but in general he exercised those powers with restraint. He was beset not only by the difficulties of the war, but by opposition from men on his own side. His cabinet was rent by internal jealousies and hatred; radical abolitionists condemned him as too mild; conservatives were gloomy over the prospects of success in the war. speech delivered by Abraham Lincoln on Nov. 19, 1863, at the dedication of the national cemetery on the Civil War battlefield of Gettysburg, Pa. It is one of the most famous and most quoted of modern speeches. 1820–91, Union general in the American Civil War, b. Lancaster, Ohio. Sherman is said by many to be the greatest of the Civil War generals. ..... Click the link for more information. took Atlanta. ..... Click the link for more information. . The next morning Lincoln died. His death was an occasion for grief even among those who had been his opponents, and many considered him a martyr. As time passed Lincoln became more and more the object of adulation; a full-blown "Lincoln legend" appeared. Yet, even if his faults and mistakes are acknowledged, he stands out as a statesman of noble vision, great humanity, and remarkable political skill. It is not surprising that the Illinois "rail-splitter" is regarded as a foremost symbol of American democracy. Paintings, sculptures, and architectural works memorializing Lincoln are legion; the most famous shrines are his home and tomb in SpringfieldSpringfield. monument, 107 acres (45 hectares), in Potomac Park, Washington, D.C.; built 1914–17. The building, designed by Henry Bacon and styled after a Greek temple, has 36 Doric columns representing the states of the Union at the time of Lincoln's death. ..... Click the link for more information. in Washington, D.C.
Innumerable biographies, novels, poems, plays, and essays have been devoted to Lincoln. His collected works were edited by R. P. Basler (9 vol., 1953). See also D. C. Mearns, ed., The Lincoln Papers (1948) and P. M. Angle and E. S. Miers, ed., The Living Lincoln (1955). The standard older bibliography is J. Monaghan, Lincoln Bibliography, 1839–1939 (2 vol., 1943–45); others are P. M. Angle, A Shelf of Lincoln Books (1946); V. Searcher, Lincoln Today (1969); E. W. Matthews, Lincoln as a Lawyer (1991). One of the most important early biographies was W. H. Herndon and J. W. Weid, Herndon's Life of Lincoln (3 vol., 1889; ed. by P. M. Angle, 1930, repr. 1965). J. G. Nicolay and J. Hay wrote Abraham Lincoln: A History (10 vol., 1890; abbr. ed. 1966). Probably the most popular biographies are C. Sandburg, Abraham Lincoln: The Prairie Years (1926) and Abraham Lincoln: The War Years (4 vol., 1939); a one-volume condensation was first published in 1954. See also The Lincoln Reader (1947, repr. 1964; ed. by P. M. Angle) and biographies by Lord Charnwood (1916, repr. 2012), A. J. Beveridge (2 vol., 1928; repr. 1971), B. P. Thomas (1952, repr. 1968), S. Lorant (1954, repr. 1961), J. G. Randall and R. N. Current (4 vol., 1955, repr. 1997), R. H. Luthin (1960), P. B. Kunhardt, Jr., et al. (1992), S. B. Oates (1984 and 1994); D. H. Donald (1995), A. C. Guelzo (2000), R. Carwardine (2006), M. Burlingame (2 vol., 2008), R. C. White, Jr. (2009), and S. Blumenthal (2 vol., 2016–). Almost the only work portraying Lincoln in a completely unfavorable light is E. L. Masters, Lincoln the Man (1931). 1881–1953, American historian, b. Indianapolis, Ind. He taught history and political science at various colleges before joining (1920) the faculty of the Univ. of Illinois. ..... Click the link for more information. . See also T. H. Williams, Lincoln and the Radicals (1941, repr. 1965); H. J. Carman and R. H. Luthin, Lincoln and the Patronage (1943, repr. 1964); F. H. Meserve and C. Sandburg, The Photographs of Abraham Lincoln (1944); J. Monaghan, Diplomat in Carpet Slippers (1945, repr. 1962); B. J. Hendrick, Lincoln's War Cabinet (1946, repr. 1965); B. P. Thomas, Portrait for Posterity: Lincoln and His Biographers (1947); W. B. Hesseltine, Lincoln and the War Governors (1948); R. N. Current, The Lincoln Nobody Knows (1958); D. H. Donald, Lincoln Reconsidered (2d ed. 1961, repr. 1989) and "We Are Lincoln Men" (2003); D. E. Fehrenbacher, Prelude to Greatness (1962, repr. 1970) and The Leadership of Abraham Lincoln (1970); W. H. Townsend, Lincoln and the Bluegrass (1989); G. Wills, Lincoln at Gettysburg (1992); J. T. Glatthaar, Partners in Command (1994); M. E. Neely, Jr., The Last Best Hope of Earth (1994) and Lincoln and the Triumph of the Nation (2011); P. S. Paludan, The Presidency of Abraham Lincoln (1994); M. D. Peterson, Lincoln in American Memory (1994); D. L. Wilson, Honor's Voice: The Transformation of Abraham Lincoln (1998) and Lincoln's Sword: The Presidency and the Power of Words (2006); J. Morris, Lincoln (2000); W. L. Miller, Lincoln's Virtues (2002); R. C. White, Jr., Lincoln's Greatest Speech: The Second Inaugural (2002); M. Lind, What Lincoln Believed (2005); D. K. Goodwin, Team of Rivals: The Political Genius of Abraham Lincoln (2005); D. M. Epstein, The Lincolns (2008); A. C. Guelzo, Lincoln and Douglas (2008); F. Kaplan, Lincoln: The Biography of a Writer (2008); P. B. Kunhardt 3d et al., Looking for Lincoln: The Making of an American Icon (2008); J. M. McPherson, Tried by War: Abraham Lincoln as Commander in Chief (2008); C. B. Flood, 1864: Lincoln at the Gates of History (2009); H. L. Gates, Jr., and D. Yacovone, ed., Lincoln on Race and Slavery (2009); E. Foner, The Fiery Trial: Abraham Lincoln and American Slavery (2010); C. L. Symonds, Lincoln and His Admirals (2010); J. Burt, Lincoln's Tragic Pragmatism: Lincoln, Douglas, and Moral Conflict (2012); H. Holzer, Emancipating Lincoln (2012) and Lincoln and the Power of the Press (2014); L. P. Masur, Lincoln's Hundred Days (2012); D. Von Drehle, Rise to Greatness (2012); J. Zeitz, Lincoln's Boys: John Hay, John Nicolay and the War for Lincoln's Image (2014). Abraham Lincoln (1809–1865), President of the United States during the Civil War. Alexander Gardner/Getty Images. Abraham Lincoln attended many séances, even having some at his own home. He was as much a Spiritualist as anything else. He was not of any particular Christian faith, although he certainly did seem to believe in an Infinite Intelligence. In the days before the Civil War, only 25 to 35 percent of the population actually belonged to a Christian denomination. The vast majority did not belong to any church, though most seemed to have believed in an afterlife. Spiritualism competed with Christianity and, in the latter part of the nineteenth century, became the fastest growing religion in America. The Lincolns had lost three of their four sons to childhood diseases so it was natural that Mary Todd Lincoln, the President’s wife, wanted to attend séances. Colonel Simon F. Kase told of a notable one in the home of Mrs. Laurie, which both he and the President attended. The Laurie’s daughter, Mrs. Miller, was the medium and she played the piano while in trance. As she played, two legs of the instrument levitated several inches off the floor then repeatedly banged back to the floor to beat time to the music. As it kept rising up, Kase and two soldiers who were present climbed on the piano together but were unable to make it settle down again until the medium stopped playing. It was reported that the legs rose as high as four inches off the floor. Abraham Lincoln had many prophetic dreams, including one of his own death. In early April 1865, he dreamed he was lying in bed when he heard the sound of sobbing. Getting up and leaving his bedroom, he went into the East Room of the White House where he saw a line of people filing past a catafalque. They were all paying their respects to the figure lying in state, guarded by four soldiers. The face of the figure was covered so, in the dream, Lincoln asked one of the soldiers who had died. The soldier replied, “The President. He was killed by an assassin.” Lincoln later told his wife, Mary, and several friends about the dream. It was later that same month that he was shot and killed by John Wilkes Booth. Another of Lincoln’s prophetic dreams was of a damaged ship sailing away with a Union ship in hot pursuit. Lincoln had this dream on a number of occasions, each time just before an important Union victory. In 1854, ten years before the end of the Civil War, 15,000 Americans had petitioned Congress for a scientific study of Spiritualism, but the request was denied. The tremendous death toll of the war led to even more of an interest in Spiritualism. (1809–65) sixteenth U.S. president; born near Hodgenville, Ky. Born in a log cabin to a modest farm family, he moved early with his family to Indiana. His mother died in 1818 and his stepmother, Sarah Bush Johnston, provided a fine model who inspired the ambitious but unschooled boy to discipline and educate himself. The Lincolns moved to Illinois in 1830, and, after twice sailing a flatboat to New Orleans, he settled in New Salem, Ill., where he pursued workaday jobs while studying law on his own. In the 1832 Black Hawk War he served as a volunteer but saw no action. In 1835 he entered the Illinois state legislature as a Whig; after unremarkable service, Lincoln left the legislature in 1841. In 1837 he had begun what would become a successful law practice in Springfield, the capital of Illinois; in 1842 he married Mary Todd, of a prominent Springfield family. His position as a prominent Whig in Illinois took him to the U.S. House of Representatives in 1847–49, where he again had a lackluster record despite his opposition to the war in Mexico. Back in Springfield he gradually began to prosper as a lawyer, often representing business interests, but his eloquently-stated if moderate antislavery views gained him increasing attention. This came to a head during his unsuccessful race (1858) for the U.S. Senate against Stephen A. Douglas, who led the Democratic accommodation to slave interests; the historic debates between the two men secured Lincoln a national following, which led to his becoming the presidential nominee of the new antislavery Republican Party in 1860. Although he received only 40% of the popular vote, due to a split in the Democratic party Lincoln won a majority of the Electoral College votes. Although he had stated his willingness to tolerate slavery where it currently existed, his election precipitated the secession of Southern states and the formation of the Confederacy. In the years of civil war that followed, the inexperienced Lincoln proved to be one of the most extraordinary leaders, both political and moral, the U.S.A. has ever seen. First defining the war as being fought over secession rather than slavery, he oversaw the creation of the Union army. When the political time was right, Lincoln announced the Emancipation Proclamation in September 1862, thereby interpreting the war as a crusade against slavery; he later oversaw the passage of the Thirteenth Amendment (1865), which legally ended slavery. With his immortal Gettysburg Address (November 1863), Lincoln further defined the war as the struggle for preservation of the democratic idea, which he called "government of the people, by the people, for the people." Meanwhile, he took a direct interest in the conduct of the war, hiring and firing generals, getting daily reports from the battlefields, and visiting the troops in the front lines. All this time, too, he had to mediate between the pressures of radical and conservative elements of the North, using an astute combination of suppression and conciliation, and barely surviving the election in 1864. Having seen the victory of the Union forces in April 1865, Lincoln was beginning to plan a generous reconstruction policy when he was assassinated by Southern fanatic John Wilkes Booth. His body was taken by train from Washington to be buried in Springfield, Ill., as the nation he had refounded mourned their "Father Abraham." Master of both a Biblical eloquence and a homespun vernacular, a natural at combining practical politics with moral principles, in only four years as president he had established why he is one of the few Americans who truly "belong to the ages."